Today, the increasing antibiotic resistance of microbial germs poses a considerable risk for the spread of infectious diseases. The development of new drugs is therefore undoubtedly a central task of research. 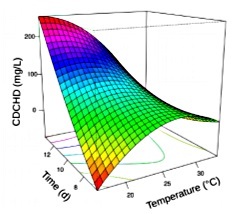 Among active ingredients, chelocardine (CHD) represents a tetracycline-like substance class with a promising compound spectrum. Interestingly, CHD also act against resistant pathogens, where classical tetracyclines fail. Here we are working on the improved production of the active substance with Amycolatopsis sulphurea. Specifically, we investigate the nutritional needs of the filamentous soil bacterium using 13C isotope studies to develop customized media for biotechnological production. For the synthesis of secondary metabolites such as CHD the right combination of nutrients provides a key to success. In the BMBF joint project "Natur-Präklinik" we closely cooperate with our partners at the HIPS in Saarbrücken (Prof. Rolf Müller), at the HZI in Braunschweig (Prof. Marc Stadler, Prof. Joachim Wink) and at the Saarland University (Prof. Uli Kazmaier), who, among other things, create new production strains and chemical derivatives of the product with an extended spectrum of activity.